The charming artisanal scent blends is a warm and spicy blend with musk. Wild. Charming. Irresistible. To Tom Ford, leather and suede have a powerfully addictive pull. In this elegant musk-inspired fragrance, he captures the primal essence of these supple, sensual, materials, giving them beautiful new dimension with a surprising musk medley that is heightened with velvety rose and warm amber. Fragrance Family: Warm & Spicy. Unisex. On clean skin, spray fragrance once or twice on desired areas. Do not rub the fragrance on the skin, as this will alter how the fragrance develops. Pro-Tip: Build a personal collection of fragrances for every mood. White Suede is wild, charming and irresistible. 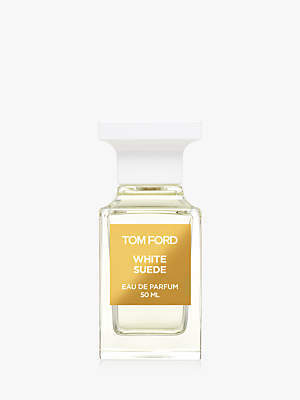 An addictive musk creation captures the primal essence of leather and suede, sending a powerful message of raw desire. TOM FORD. Inspired by the sublime essence of the fragrances, the White Suede Collection features three Lip Colours in White Suede, Jasmine Musk and Musk Pure and debuts a new Eye Quad of soft, sophisticated shadows that harness the stimulating warmth of musk. The White Musk Collection fragrances are presented in their original ivory and clear tones of the iconic 50ml Private Blend bottle, designed to look like a chess piece.